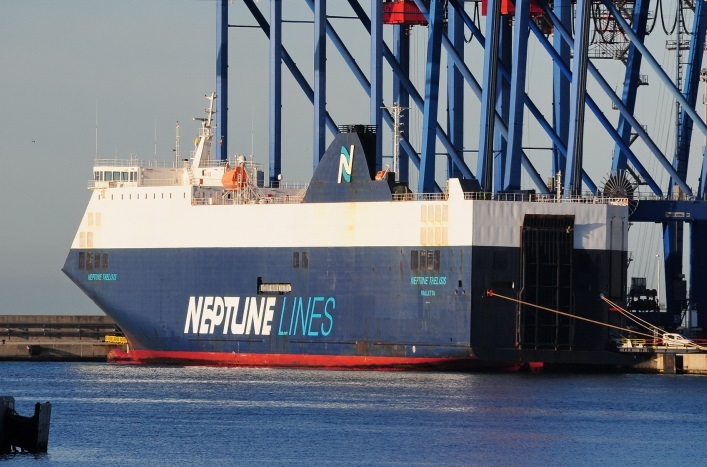 The car carrier Neptune Thelisis collided with quay and crane in Port of Luka Koper, Slovenia. The ship was moored at the port, but strong winds with gusts reaching 110 km/h and severe storm hit the port, causing braking of bow mooring lines. The vessel adrifted with her bow and turned around the key under the strong pressure of the gusts. car carrier Neptune Thelisis struck against the quay and a gantry crane of the coal terminal collapsed. The accident was immediately reported to local authorities and at the scene were sent tugs which assisted with fixing and securing the cargo ship. There were no injuries among the dockworkers and crew, but the damages caused by the storm were sufficient, as according to Port of Luka Koper administration the cost were 10-15 million EUR. The local authorities initiated investigation for the responsibilities and the root cause of the accident. The car carrier Neptune Thelisis suffered only minor damages and dents during the allission. There is no report about water pollution as well. The vessel will be inspected before return in service. The car carrier Neptune Thelisis (IMO: 9306718) has overall length of 165.00 m, moulded beam of 26.23 m and maximum draft of 5.80 m. The deadweight of the ship is 6,200 DWT and the gross tonnage is 27,788 GRT. The car carrier was built in 2006 by Fincantieri Palermo shipyard and operated by Neptune Lines.